This little Nordic blooms tiered baby dress by Tea Collection started out life at $35.00 and has since dropped in price by 73%, down to just $9.95 on Amazon! 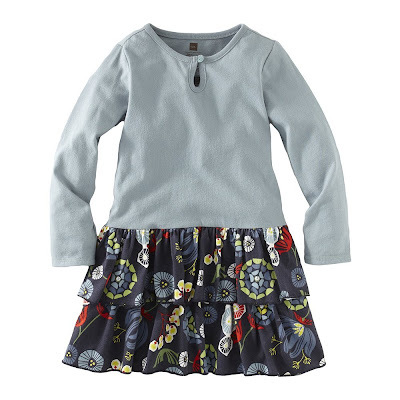 Available, in small (6-12 months) and medium (12-18 months), it also ships for free. What a wonderful and inexpensive way to expand a little wardrobe a bit! Thanks for the tip, I just got one as a sweet gift for a friend! Also, I just checked amazon, because my baby is growing out of her leveret pajamas that we bought on sale before, and I just ordered a bunch more, since they are on sale again! $9.99! And lastly, the PlanToys kitchens are on sale on Amazon again--not the amazing $60 sale, but at $99, it's not too bad, right? I love your updates and often, often snap things up right after you post! Thanks so much for keeping up the blog! Thanks for the note, Becca! And thank you for the Amazon updates... I did not realize that the Leveret PJs had been marked down. I so appreciate good sale info. Thank you for reading the blog! Let me know if you want me to remove the links or your name for any reason. Thanks so much for the info!